Studio Ponoc is an off-shoot of Studio Ghibli, with many former animators and directors coming to work for this new start-up after leaving Ghibli when famed director Hayao Miyazaki retired. 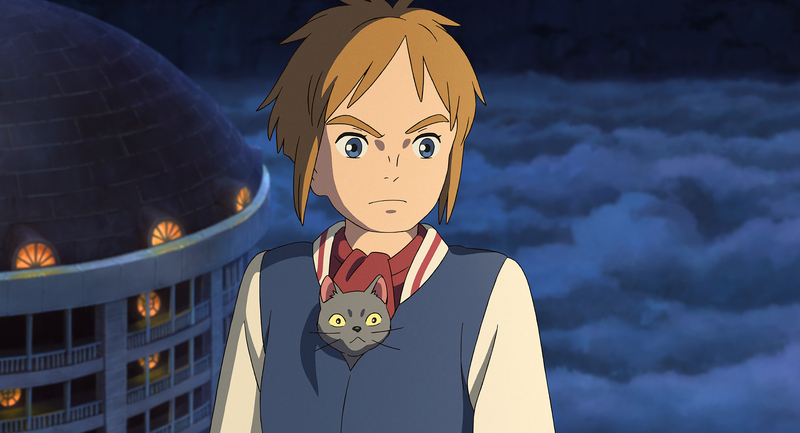 Ghibli halted development, Ponoc was born, and now even with Miyazaki returning for a new film to be released in 2020, Ponoc marches forward with their own designs. Let’s be honest; they look exactly like what we’ve seen before, the Japanese animation that we’ve grown to love, and I doubt many of us care what the company is called, as long as we still get all the wonderful movies that have come across the sea over the past years. I love this style, I’ve talked about it ad nauseam, and the magic continues here with Mary and the Witch’s Flower, fantasy done brilliantly. Mary is a clumsy little British girl who is spending the summer holiday with her great-aunt in the country, having moved to the little village before her parents, who are off working and will follow in due time. For the present, Mary is bored and feels useless, with nothing to do but explore the surrounding woods and talk to the friendly, neighborhood cats. One day, she follows a tom named Tib into the forest, where she discovers a lovely, shining, blue flowering plant that accidentally gives her strange powers. She also finds an old broom, which is also endowed with something magical, and riding it, Mary discovers a strange land she’s never heard of before, where animals talk and students come to learn how to be witches and wizards. But all is not as it seems, and this special girl will have to keep her wits about her if she ever wants to see home again. Delightful, simply delightful, which is just how Ghibli films are, and is apparently how Ponoc films will be as well. First, backstory; this movie is based on a children’s book called The Little Broomstick, written by Mary Stewart in 1971. I’ve never read the story, but if the movie is any indication, I wouldn’t be surprised if a certain Rowling didn’t get a lot of her ideas from a certain fellow female Brit. It’s well-documented that Rowling borrowed heavily to write Harry Potter, but that’s no knock on her; Tolkien took a lot that already existed to create his world too. I’m not sure that what you steal is important, only that you give credit where credit is due and you weave something wonderfully new with the existing parts, which the best authors are able to do with seeming ease. 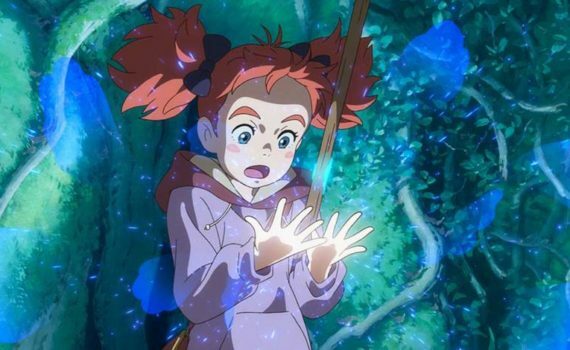 Anyway, on to Mary and the Witch’s Flower. The English-dubbed cast is great: Barnhill from BFG, Winslet & Broadbent from virtually everything else. Their voices are perfectly sonorous, as are those of the side cast, and it’s a pleasure just to listen to them. The music is also wonderful, which is also a hallmark of this animation, powerful scores every time. I tend to like the more childish of this genre, the ones based on fairy tales and such, they just seem to resonate with a magical aspect so well, and I watch them with my kids, which I’m sure helps me love them. But why wouldn’t I; Mary is a great character, the action is fun, the visuals are astounding, the simplicity of the story is something that American animators just don’t understand, and it’s almost more a painting that a film, in a way that’s refreshing and welcomed and lovely. I can’t get enough of Ghibli, Ponoc, whoever might pop up next, and I hope they keep producing, because I’ll always be here to watch.